Sony Computer Entertainment Europe is pleased to unveil the latest instalment in the multimillion-selling action adventure franchise, UNCHARTED. 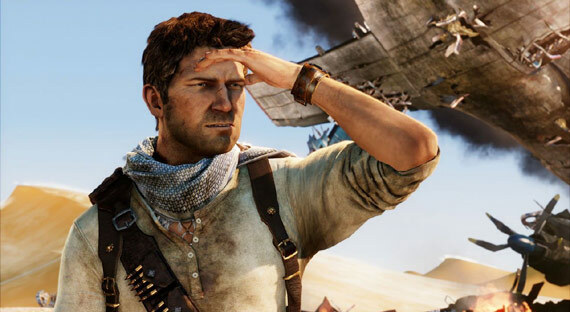 Developed exclusively for PlayStation 3 by the team at Naughty Dog, UNCHARTED 3: Drake’s Deception blurs the entertainment boundaries, delivering the cinematic scale, adrenalin rushes, thrills and mystery that are the UNCHARTED trademark; together with its unique and enhanced multiplayer experience. Fans of the franchise and newcomers alike will relish the opportunity to catapult themselves headlong into a real adventure, in a search for the fabled “Atlantis of the Sands.” The journey propels fortune hunter Nathan Drake on a daring trek into the heart of the Arabian Desert, a journey that pits him and his mentor Victor Sullivan against the occult treachery of a shadowy clandestine organization and its ruthless leader. When the terrible secrets of this lost city are unearthed, Drake’s quest descends into a desperate bid for survival that strains the limits of his endurance and forces him to confront his deepest fears. With its award-winning storytelling, blockbuster cinematic action sequences, immersive high resolution 3D and stunning environmental detail and effects, UNCHARTED 3: Drake’s Deception is the chance to lose yourself in the world of Nathan Drake – and to experience the true power of PlayStation 3. More Stealth, 3D Support, Clandestine organisations, remote locations and ancient secrets. Sony I am in first day!